For starters, I would like to thank Carly Kade for everything and especially taking the time to work with me. I had this idea brewing for a while and it took be a bit of time to get my questions sent into her. After she sent them back with her response it then took me forever to finally post them on Booking Around. She never once bothered me or bugged me about it and I thank her for being so patient! She’s be amazing to work with and I thoroughly enjoy this friendship we’ve built! I would like to thank her for saying yes to this interview and making it such a great experience! 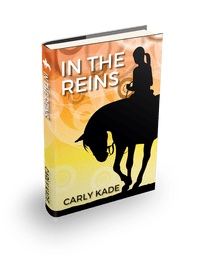 For those of you who don’t know, Carly Kade is the author of In the Reins. If you’ve yet to read her book then I highly suggest you do, It would be perfect for both non-horse lovers and horse lovers alike! You may check out my review on her book here. No matter where I am I love to listen to music when I write … all kinds of music … what I listen to depends on my mood. Some days it’s classical, sometimes it’s a movie soundtrack, other days it’s jazz or classic rock, and a lot of the time it is country. I often write about what I’m listening to on my blog. It is mentioned that Devon’s favorite online store is heavesenthorse.com what is your favorite online horsey store? I’m sure fellow In The Reins lovers would love to know this as much as I would, do you have an idea of when your second book with be released? I know I can’t wait for its release date as well as the title/cover reveal! 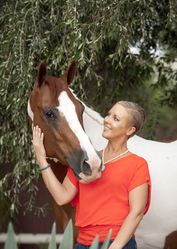 Carly Kade is an Arizona-based equestrian author. Creative writing makes her spurs jingle! She writes fiction about horses, horse shows, western pleasure and a handsome cowboy or two. Her books are for people just like her … crazy about reading, horses and cute cowboys! A city-girl-gone-country, a handsome cowboy and a horse meet by fate on a southern farm. She’s looking for a fresh start and unexpectedly falls for the mysterious cowboy. But can a man with a deeply guarded secret open himself up to the wannabe cowgirl in the saddle next to him? Feeling Social? Check out these links! My spurs are totally jingling. I am so honored to be your first author interview! I really enjoyed working with you. My favorite questions were how is Faith like my own horse and how am I similar/different from my leading lady. I can’t wait to share the sequel with you! Here’s to loving books and horses. I appreciate your partnership!